This was a review of a novel by David Drake that I wrote for BullSpec 3, Autumn 2010. Why are we so fascinated by ancient Rome? From I, Claudius by Robert Graves to Imperium by Robert Harris to the crime novels of Lindsay Davies or Stephen Saylor, Rome crops up again and again as a setting for fiction. It’s not just the lure of the ancient: by comparison Greece (the novels of Mary Renault) or Egypt (the occasional Agatha Christie crime story) are barely represented in our literature. It is probably because the Romans wrote about themselves so much: we have their cookbooks, we know how their domestic buildings were constructed and decorated, letters that have been recovered along Hadrian’s Wall reveal requests for socks among other things. There is an ordinariness about how the Romans appear to us, a sense of how it felt to live in that time and place. Those mundane details, a much richer resource than is available for other ancient cultures, or indeed for many of those that came after, provide the verisimilitude the novelist needs. Yet this everyday familiarity is combined with the genuine alienness of Roman political and social structures, their view of their world and of their place within it. Put together, this combination of the ordinary and the strange is irresistible. The problem (which I’ll come to later) is when writers try to make Rome even stranger than it was. 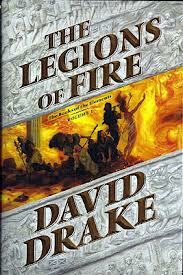 Of course, David Drake’s The Legions of Fire, the first volume in a new fantasy series, is not actually set in Rome, but in the city of Carce (Drake insists this is pronounced Car-see, but if my old Latin teacher was right about pronunciation it should be much closer to ‘khaki’). Except that Carce has the same history as Rome: there are references to the Etruscans, the Punic Wars, Caesar’s conquest of Gaul; it has the same geography as Rome: the Alps to the north, the border along the Rhine, philosophy teachers from Athens; it even has the same literature as Rome: Virgil’s Aeneid, Caesar’s Gallic Wars. In other words, except for the name, Carce is Rome. There’s even enough information to identify a date: given how long it is since the war against Carthage, we can calculate that this is early in the first century of the Christian era, probably during the reign of Tiberius. One minor character is a member of the Piso family, presumably the same powerful Piso family implicated in the murder of Germanicus in AD19; and there is a lot of worry about imperial torture that was a feature of Tiberius’s reign. Given how closely Carce cleaves to Rome in every particular, one can only wonder why Drake felt it necessary to give the place a different name. The first two-thirds or so of the novel are set in Carce, and this is easily the best part of the book. Lindsay Davies has demonstrated how easily a mid-twentieth century demotic, modeled on Raymond Chandler’s prose style, fits a first century Roman milieu. Drake does something similar; his prose has somewhat less Chandleresque style, and there are a few too many modern Americanisms for real comfort, but it helps to present his version of Rome as an immediate and lived experience. And he is at his best in the small details that make the city feel real: the problem of walking on city cobbles in hobnailed army boots; the state of a sedan chair hired for a high-born lady. There is one wonderfully comic scene in which a routine civic ceremony is endlessly delayed because it needs the auspicious flight of birds in one direction across the sky and no birds happen to be flying that way. Though against this I am less convinced by the relationships he presents between slaves and masters, or between high born and low born. The plot begins when a distrait senator falls under the spell of a Hyperborean wizard, Nemastes. At first his family is merely concerned about the influence, but gradually they find themselves battling a threat not only to the family but to the whole of their existence. It begins when Varus, the senator’s son, is giving a public reading of his not very good epic poem and, in mid-verse, finds himself helplessly incanting something that gives his audience visions of a fiery hell. Meanwhile his best friend, Corylus, the son of a soldier and the epitome of Roman martial bearing but with modern literary sensibilities, sees a vision of his own: a frozen, northern shore. These visions increase in frequency and ferocity until the two friends find themselves drawn into these strange landscapes. During the course of these adventures, Varus discovers unrecognized physical and intellectual resources, which means he grows as the story develops. Corylus, in contrast, remains pretty much the clever and able soldier all the way through; he’s the obvious hero figure, except that he’s just not that interesting. The two women caught up in this are far more interesting characters than either of the men, and I kept wishing that Drake would find more to do with them than he does. Alphena is Varus’s younger sister; impetuous and rebellious, she insists on taking part in weapons training in the family’s private gym. If, at times, she comes across as more of an American tomboy than a member of a Roman senatorial family, she is still an attractive character. But even she pales beside her step-mother, Hedia a Roman matron with a dubious past who would, you feel, be more than a match for the imperious and poisonous Livia of Robert Graves’s I, Claudius. Hedia is the character who feels most as if she belongs in the time and place of the novel, her actions and beliefs shaped by the nature of Roman society. For instance, she wants to get Alphena married off (which Alphena regards as an antagonistic act) because she senses a doom about to fall upon the family, and marriage would be a way to separate Alphena from the family and so protect her. Their all-night vigil in a temple as part of this marriage project proves to be yet another opportunity for the supernatural to burst into Carce. At first the visions these four characters experience are enigmatic and disturbing, and their attempts to understand what is happening, by for instance, consulting the Sybilline Prophecies or visiting a wise woman, provide a solid historical foundation for the fantasy. But when the four are drawn into the landscape of their visions, the novel looses any sense of real substance. This is not strangeness happening within a solidly described reality, but strangeness simply piled upon strangeness. Although each of the four is given the opportunity to pose heroically, they are, in fact, barely agents of their own fate. Chance encounters and coincidences always seem to provide them with some clue or necessary token just before they come upon the next challenge. It is hard to care what is going on if, literally, anything can happen. The fairytale landscape of fauns and giants and magical swords in which the two women find themselves seem particularly inconsequential. And when, after far too many pages, all four arrive back in the same place at the same time, the Temple of Jupiter in the heart of Carce, we realize that this whole interlude was, in fact, irrelevant, because nothing endured or discovered in their journeys has anything more than an incidental effect upon the climactic battle that now takes place. The Legions of Fire is a fun novel, a quick and entertaining read, but it would have been a better book if it had been more an historical novel and less a fantasy.